Well-established manufacturers of lactase enzymes, with their occupancy largely concentrated in Europe, are eyeing consolidation in emerging markets to strengthen their global market foothold. These manufacturers are now targeting untapped opportunities in the developing nations. Leading players such as Koninklijke DSM N.V. are witnessing significant business expansion related to dietary supplements, which is a key application area of lactase enzyme, in China. Additionally, other key players, such as Chr. Hansen Holding A/S, are focusing on reducing their dependency on European market, shifting their focus to countries in Latin America and Middle East & Africa. The significant rise in global demand for lactose-free food products is widening the range of food & beverage applications of lactase enzymes, which is influencing business strategies of market players in the lactase enzyme market. An upsurge in demand for lactase enzymes in the F&B space is encouraging manufacturers, such as Chr. Hansen A/S, in putting efforts to achieve consumer-driven commercial success in the lactase enzyme market. Sensing evolving requirements of end-users to ensure low lactose levels in dairy products, prominent lactase enzyme manufacturers such as Chr. Hansen A/S, have introduced novel test kits that measure lactose levels. Such product launches by leading market players are aimed at attracting dairy manufacturers who continuously seek ideal solutions for process control. 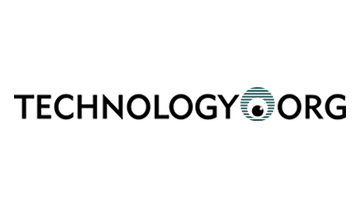 Key lactase enzyme manufacturers are also entering into strategic collaborations for marketing their cost-effective lactose-analyzing devices, which enable efficient and fast measurement of lactose levels in dairy products. Lactase enzymes continue to witness widespread adoption across various application areas ranging from food & beverages to pharmaceuticals. However, challenges prevail apropos of lactase enzymes’ stability when subjected to thermal and mechanical treatment, which in turn have adverse impact on efficiency of the industrial processes. These challenges are being significantly resolved by manufacturers, who are adopting advanced production technologies such as immobilization and genetic engineering, which ensure higher stability and improved productivity. Benefits of genetic engineering that include high-quality yield and accelerated manufacturing process of lactase enzymes, and suitability of immobilization technology when it comes to efficient, large-scale manufacturing of lactase enzymes have meant that, these production technologies will remain preferred among lactase enzyme manufacturers. Lactose intolerance continues to persist as a major concern among the world’s adult population, with nearly 75% unable to consume milk and its derivatives. The advent of lactase enzyme, such as β-galactosidase, has emerged as a boon for dairy producers, as it hydrolyzes lactose to readily digestible sugars such as galactose and glucose. The recent surge in number of consumers shifting towards lactose-free dairy products is making a huge impact on the dynamics of the lactase enzyme market. Lactose-free dairy products are gaining popularity, not only among lactose-intolerant consumers, but along among consumers who can digest lactose, which reflects a broader consumer trend. Dairy manufacturers are capitalizing on the rising retail value of lactose-free dairy products as compared to that of regular dairy products. This is encouraging most dairy manufacturers worldwide to add lactase enzymes in the dairy production processes, which is boosting demand for lactase enzymes across the world. 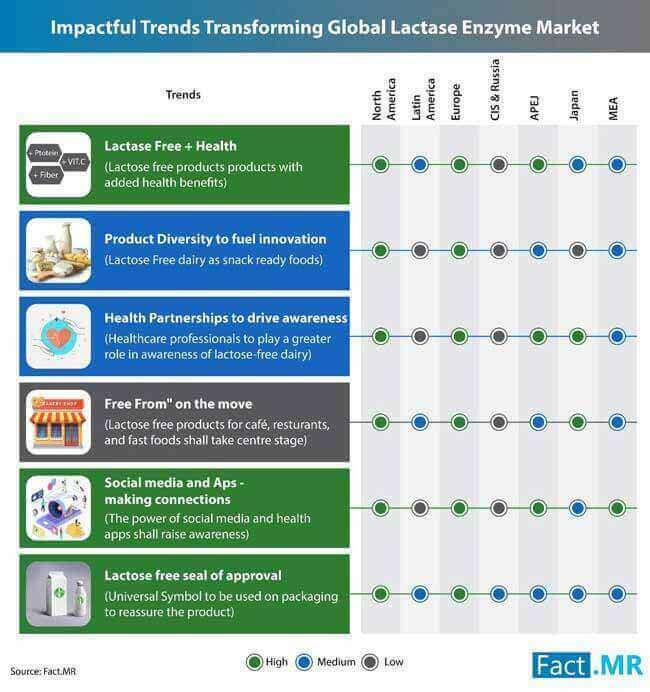 Leading manufacturers in the lactase enzyme market are adopting strategies to leverage rising demand for lactose-free dairy products by increasing production of lactase enzymes. For example, DuPont de Nemours and Company – an American conglomerate – recently announced that, with its GODO-YNL2 lactase enzyme, the company is aiming to boost profitable growth in the dairy industry. Chr. Hansen Holding A/S – another leading manufacturer in the lactase enzyme market – declared its strategy to invest heavily in its dairy fermentation capacity in Copenhagen to benefit from the rapidly-growing dairy industry. Taking into consideration the need for delivering safe food ingredients, manufacturers of lactase enzymes need to meet the food safety requirements developed by regulatory bodies across the world. Owing to the rise in number of label-conscious consumers across the world, manufacturers in the lactase enzyme market are putting extra efforts into pursuing necessary certifications from governing bodies. The inevitable need for gaining certifications, such as Kosher and Halal, from internationally recognized certification bodies may require lactase enzyme manufacturers to modify their manufacturing and/or marketing strategies. This may lead to making it more challenging for market players in the lactase enzyme market to mitigate manufacturing costs to maintain a competitive product price. With a majority of consumers becoming health conscious and preferring low-calorie diets, demand for food products containing lower sugar content has increased rapidly in the past few years. The recent trends in the lactase enzyme market are mainly driven by a rising percentage of health-conscious consumers preferring food products low on sugar and lactose. As the health and wellness trend is encouraging consumers to eat healthier, food products manufactured by using lactase enzymes have gained a stand-out health appeal, which is ultimately boosting the growth of the lactase enzyme market. Lactase enzyme manufacturers are focusing on spreading awareness about the added benefits of adding lactase enzymes to various food products in improve taste, flavor, texture, and reducing sugar content in the products to attract a large consumer base. The Fact.MR report provides detailed information about growth parameters of the lactase enzyme market with the help of a detailed assessment of the competitive environment in the lactase enzyme market. The market study provides a comprehensive data on each stakeholder in the lactase enzyme market, including Chr. 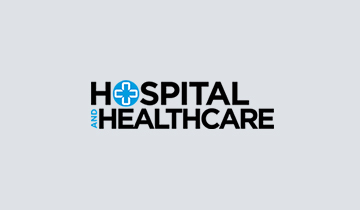 Hansen Holding A/S, Advanced Enzyme Technologies Limited, DuPont de Nemours and Company, DSM Chemicals, Novozymes A/S, Merck KGaA (Sigma-Aldrich), Sternenzym, Amano Enzyme Inc., Calza Clemente, Senson, and Specialty Enzymes & Biotechnologies. The report provides readers with all-encompassing data on each manufacturer’s revenue shares, winning strategies, and latest information on mergers and acquisitions in the lactase enzyme market. Considering the rapidly-growing dairy industry, Koninklijke DSM N.V. launched ‘Maxilact Smart’, which is claimed to be the fastest lactase enzyme by the company. DSM aims to attract a large number of dairy manufacturers by providing an innovative lactase enzyme that can enhance the efficiency and speed of the lactose-free dairy manufacturing processes. Other established manufacturers in the lactase enzyme market, such as Chr. Hansen Holding A/S and DuPont de Nemours and Company, are focusing on establishing a stronger presence in developing nations in Asia Pacific and Middle East & Africa. Meanwhile, emerging players are shifting their focus on developing lactase enzymes for innovative applications, such as pharmaceutical products and dietary supplements. Lactase enzymes are produced by microorganisms and are an essential catalyst, which helps to break down lactose among consumers with lactose tolerance. Lactase enzymes can be added to food products, beverages, dietary supplements, and pharmaceutical products in dry or liquid form. The market study on lactase enzyme market was recently published by Fact.MR, which provides comprehensive information about the most important market dynamics that prove instrumental in the growth of the lactase enzyme market during 2018-2028. Market players can find the most accurate quantitative and qualitative information about growth parameters of the lactase enzyme market in the report, which can help them to develop data-driven business strategies in the coming future. For the better understanding of readers, the Fact.MR report provides salient information about the lactase enzyme market in the most comprehensive manner. 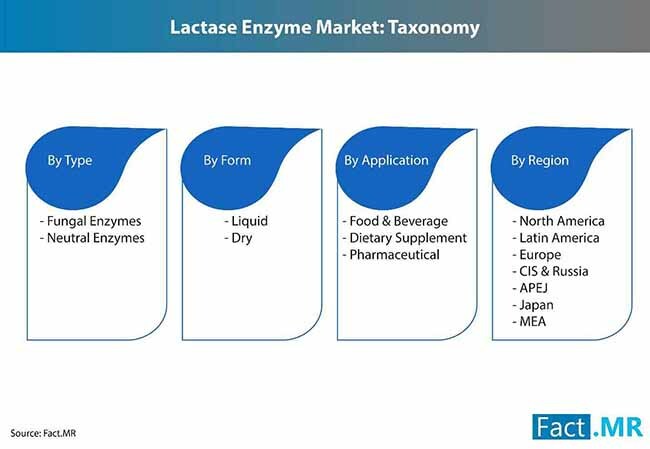 The lactase enzyme market is segmented according to geographical regions, product types, applications, and product form, to analyze the segment-wise growth of the market. Based on geographical region, the lactase enzyme market is segmented into six regions – North America, Latin America, Europe, the Commonwealth of Independent States (CIS) and Russia, Japan, Asia-Pacific Excluding Japan (APEJ), and the Middle East & Africa (MEA). The lactase enzyme market is segmented into two product types, viz., fungal lactase and neutral lactase. Furthermore, industrial applications of lactase enzymes include food & beverages, dietary supplements, and pharmaceuticals. Depending on the product form, the lactase enzyme market is divided into two categories – dry lactase enzymes and liquid lactase enzymes. 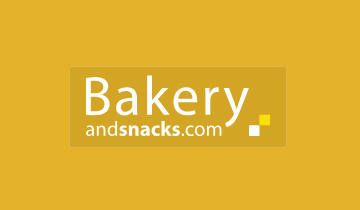 Which types of food products account for the maximum demand for lactase enzymes? Why are the sales of lactase enzymes highest in North America? Which regulations in various regional segments are influencing strategies of players in lactase enzyme market? Why is APEJ attracting most of the leading manufacturers of lactase enzymes? 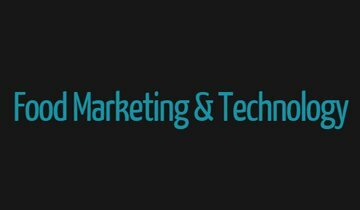 The process of market research followed at Fact.MR commences with extensive secondary research of the lactase enzyme market. Analysts obtain industry-validated, historic and current data about the demand and sales of lactase enzymes across the globe. The comprehensive secondary research is followed by primary research, where detailed information about the lactase enzyme market is obtained, in terms of value (US$ million) and volume (‘000Kg). 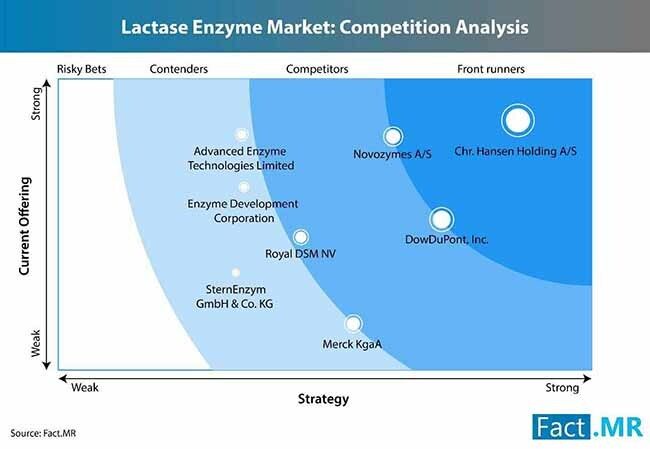 Based on thorough secondary and primary research of growth parameters of the lactase enzyme market, analysts come up with the most precise forecast on how the lactase enzyme market will grow during the forecast period.